Several people have been kind enough to let me know that ‘frost on weeds’ the previous post but one was making them feel a little sad. It’s no longer representative, either. It was only representative of that particular morning. 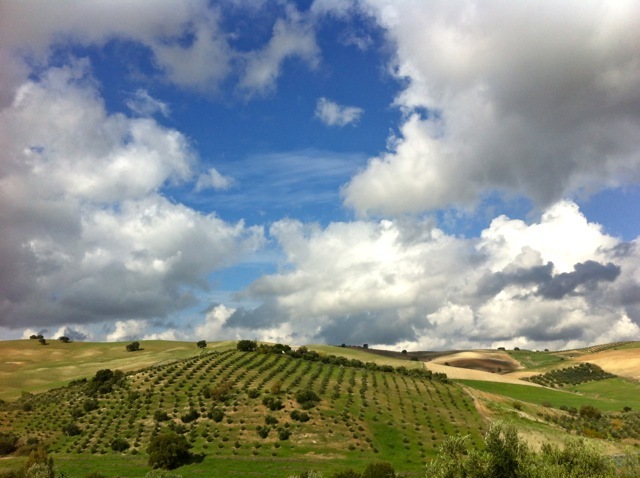 The skies over the Sierra de Cadiz throughout February have been predominantly royal blue, and when there have been clouds, as illustrated, they have been picturesque (especially when viewed through sunglasses with a yellow filter). So, while I don’t have time to write a more filling post right now (researching an article and plastering a chimney), I hope this view from the kitchen will make a more cheering note to pause on.